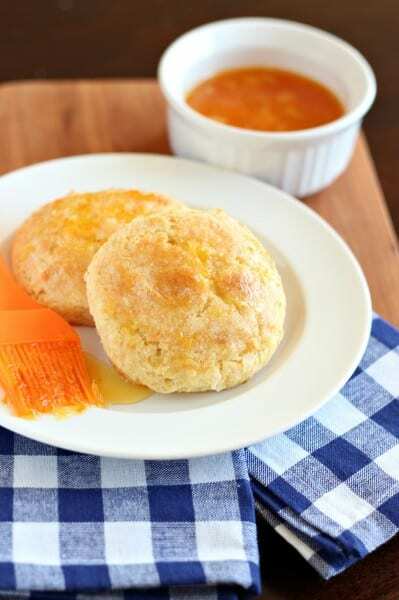 Orange marmalade scones are filled with bold, citrus flavors to perk up your day. Orange marmalade is in the scone dough and can be used on top too. Serve with tea and clotted cream if you are feeling especially British and are making the most of tea time. Oranges bring a bright, zesty addition to baked goods so this month the #TwelveLoaves bakers are bringing you the best of our orange breads from quick breads, to yeast breads and everything in between. Choose oranges– the juice or the zest, marmalade, jams, candied orange peel and more. Just make your bread ORANGE and join us in this month of baking. Scones in America haven’t reached the same popularity as muffins and I think they need their time to shine. They come together quickly without much fuss– no muffin tin or liners needed just a flat baking sheet will do. The shape is up to you– the more traditional triangle is easily formed by patting the dough into a flattened circle then cutting wedges which you slightly pull apart before baking. Or switch it up– this time I used a round cutter to make circular scones for a change. These orange marmalade scones started with a recipe I found in The Big Book of Bread, a Betty Crocker Book. The original recipe found here finds its orange flavor in orange zest, mandarin orange segments and an orange butter made with marmalade. I didn’t have mandarins on hand so I substituted 1/2 cup of freshly made orange marmalade for the mandarins. The dough was therefore slightly stickier than intended so I also added another 1/2 cup of flour. 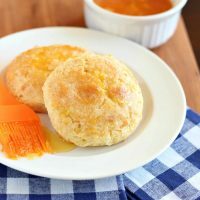 Instead of the orange butter topping I chose to brush a touch more marmalade on the warm scones, making a sticky glaze that really emphasized the orange flavor waiting tucked inside these scones that were just calling out for a first bite. Heat oven to 400 degrees F. Prepare baking sheet with parchment or silicone baking mat. Mix flour, 2 Tablespoons sugar, baking powder, and orange peel. Use a pastry blender (or two knives in the criss-cross method) to cut in the butter until the mixture has butter the size of small peas. Fold in 1/2 cup marmalade, milk and egg. Stir gently until dough forms. Empty dough out onto a lightly floured surface. Knead the dough about 8-10 times or until it comes together in a smooth ball. Pat the dough into a round circle about an inch and a half thick. Cut into wedges and pull apart to separate slightly. Alternatively use a biscuit or cookie cutter to cut 2 1/2 inch rounds. Sprinkle with remaining Tablespoon of sugar then bake for 15-20 minutes or until golden. Remove scones from oven and brush the warm scones with the remaining marmalade. Serve immediately. Being half british I love so much the fact that you state that scones deserve the same attention as muffins, well said! Scones are simply gorgeous, but you version is a gorgeous “upgrade”. Very well done, love your recipe! These are wonderful, Holly! Especially brushed with more warm marmalade when they come out of the oven. Yum! Well, I am a huge fan of scones, so I need no convincing. I would love to add one of these to my basket that is already piled high with Twelve Loaves breads this morning ;). YUM! Mmmmm….I love scones and have never made an orange version! Perfect with the double dose of marmalade!! I say a big “YES” to sticky glazes. These look wonderful Holly. I’d love one with some clotted cream and a cup of Lady Grey. Thanks, Karen, yes my fingers may have been sticky after eating these but that was hardly a concern. So good! Barb, this is where those extra miles between our homes now create a problem…I can’t get freshly baked goodies to you while they are still warm! Hope to see you soon. I’m a big fan of scones and these are so bright and lovely with the orange marmalade shining from the inside out. Thanks, Renee, these scones were awfully bright and just right for a happy start to the day!It was nice baking with you this month. Ha! Hardly any left over to share but I’d gladly make another batch! Scones deserve MORE attention than muffins, IMHO! Nice baking with you this month for #TwelveLoaves! Let’s bring scones some much deserved attention! I think they are great for brunches and tea so they lend themselves nicely to Mother’s Day, Easter, baby showers and other festive occasions in the spring. I LOVE scones. . they are seriously up there on my list with chocolate cake. 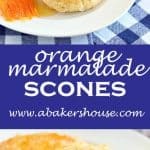 Love these orange marmalade scones!!! Pinned and can’t wait to try!!! Thanks, Alice, I’ve had fun seeing your updates from your King Arthur adventure. So many beautiful breads!! Have a great weekend! I love scones more than muffins, and these look superb! A perfect treat for spring! Thanks, Abbe, for stopping by. I think these would be nice for a Mother’s Day tea. I’ll have to work on a few more varieties before May. Holly these sounds so delicious! I love scones and will definitely be trying these! Thanks, Karen, I am going to make more scones soon too. I even have clotted cream from a nearby English tea house that I should have opened for these. Scones are really one of my favorite baked items, and these look amazing especially with that sweet, sticky glaze. I am going to make scones more often– so easy and really good. Yep, these look amazingly delicious! Wish I had one for breakfast right now! Thanks, Renee, how nice to bake along with the group this month! My thoughts are already turning to next month’s theme. They look amazing, Holly. I am looking forward to trying this with the glaze. Full of beautiful orange flavor. Wish we lived closer and I’d drop off a jar of the marmalade for you. Perfect scones, yes please I need one or two of this right now. Why I don’t make scones more often is beyond me. I am going to change that for sure! Scones are so fantastic! I love to bake them on a Sunday morning. They’re quick and amazing…and these orange marmalade scones are great, Holly! They are wonderful for our Oranges theme this month!! Thank you for being a part of our baking group!! Thanks for another great month of baking. I was so impressed with everyone this month! I really need to get on the scone wagon and make some scones. I’ve only ever made them once. I have no idea why I haven’t made them more as I see so many darn good recipes, like this one. Oooh that orange marmalade looks good and so do those scones. Thanks for sharing, Holly! Yes, me too! I want to jump on the scone wagon too and eat all of the fantastic variations I can think of– I’ll share! !